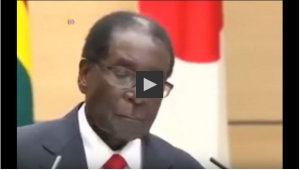 Zimbabwean president Robert Mugabe seems like he is about to doze off as he addressed a joint press briefing with the Prime Minister of Japan, Shinzo Abe. Mugabe is in Japan, where he is visiting for the fourth time, to hold his third meeting with Abe. According to reports, Mugabe might not stand for presidency in 2018 if he is unfit to do so.